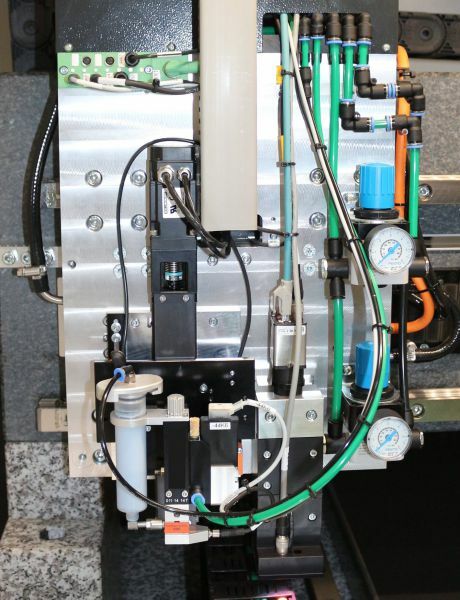 This machine was developed to fill blind vias and through holes in printed circuit boards with paste. Holes with a minimum diameter of 80 µm can be filled selectively. 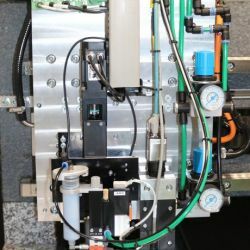 The printed circuit board is placed on the work table and pneumatically clamped. Next, the CCD camera is activated and the printed circuit board is measured. Any deviations are calculated by the controller, and the positions are automatically adjusted. Each hole is approached individually and filled in about 0.2 seconds using a micro-dosing valve. Feed rate: max. 50 m/min.